The restaurants of DineAmic Hospitality teamed with James Beard Foundation Greens for a New Year, No Waste dinner. The evening shed light on the problem of food waste and discussed what communities could do to reduce food waste. Fact: Approximately 1.3 billion tons of food produced in the world for human consumption is either lost or wasted. The United States throws away an estimated 40% of food provided, equal to $1,500 in wasted money each year in every household. The numbers are astounding considering many people go hungry and are without access to quality food. Restaurants are some of the biggest contributors with about 11.4 million tons of food wasted annually at a cost of about $25 billion per year. Chefs often awe us with beautiful food presentations created in their restaurants. However, we often don’t consider the amount of waste that comes with serving that perfect cut of fish. Therefore, it’s encouraging to hear how culinary leaders are adopting the mission to eliminate food waste while continuing to put forth beautiful flavorful dishes. Launched in 2018, Waste Not is a multi-year campaign that challenges us to reduce food waste by thinking differently about food and adopting full-use cooking methods. A series of educational tools and events were created in support of the campaign demonstrating how each can make a difference by incorporating small changes. If each American eliminated food waste just one day a week, more than 7.8 million tons of food would be saved each year — enough to provide almost 13 billion meals to the hungry. The following are a few suggestions and tips for home cooks contributed by chefs in the Waste Not Cookbook. • When salad greens start to wilt, sauté them with some olive oil and garlic for a bright side dish. • Save asparagus bottoms, carrot tops, mushroom stems, and other vegetable parts in freezer bags or containers for use in stocks, soups, and sauces. • Buy meat, poultry, and fish on the bone. Save the bones for making stocks, or cook larger meat bones and feed them to pets. • Use leftover rice to make fried rice on days you don’t feel like cooking something new, folding in whatever protein and vegetables you have on hand. • If fruit gets too soft or old, put it in the freezer to use later in a homemade smoothie, or purée and mix with seltzer for a refreshing homemade soda. 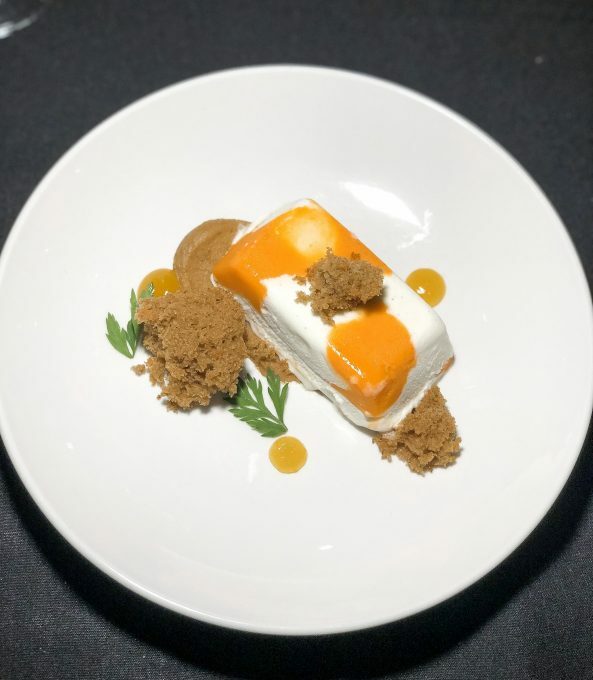 Throughout the dinner, chefs from various DineAmic Hospitality restaurants provided detailed descriptions of their dishes revealing how everything from onion peels to the usually discarded shrimp tails was repurposed to diminish or eliminate waste. Chef Ken Biffar of Siena Tavern explained how he used every part of new potatoes to create this fantastic appetizer. He first Roasted New Potatoes and removed the flesh. The skins were then fried and seasoned with sea salt. Next, the flesh was pureed with egg yolks (reserved from the salad preparation at Sienna Tavern restaurant) and then black truffle was added. They then used reserved onion; caramelized it along with black garlic to create a puree. A portion of the water used to boil potatoes for the mashed potatoes in the restaurant was added to a bit of cream to create the potato foam on top. Lastly, it was topped with Calvisius caviar, a fully sustainable fish. It was seriously one of my favorite bites from the evening with all of the levels of potato coming through. Katsuji Tanabe executive chef of Barrio, got emotional as he spoke on his personal experience with food. Growing up food was a day-to-day issue because his family didn’t know where their next meal was coming from. His mother repeatedly emphasized not wasting anything. He stated that it was important for chefs to take the lead in teaching others how to turn things around and reduce food waste. An unforgettable evening with an important message about mindfulness. Although my family and I have been proactively trying to cut down on food waste, there’s always room for improvement. Plan a menu for the week. Create a list for the grocery store with the exact quantities needed. Only buy what we need and avoid the urge to fill cabinets and refrigerator. As stated, developing good habits even in small things makes a huge difference. Hopefully, this article will inspire others to follow suit. The benefits to the earth, environment, and community are numerous. How do you reduce food waste? Let me know in the comments.